Kigozi, M. 2014. Africans doing business in Africa: The impact of a midsized company on the Ugandan economy. GREAT Insights, Volume 3, Issue 6. June 2014. Uganda is among the fastest growing countries in Africa with average GDP growth of 7% over the last 20 years. The economy was liberalised in 1989. 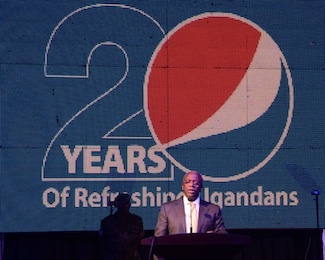 Government owned enterprises were prepared for privatisation and three Ugandan entrepreneurs bid successfully for the Lake Victoria Bottling Company Ltd. The company had been kept in business for many years by government subsidies but failed to meet the demand for carbonated soft drinks in the country. The company was renamed Crown Bottlers Ltd. (CBL), restructured and recapitalised. In parallel, the government was continually improving the investment climate through ensuring peace and stability, improving infrastructure, controlling inflation, providing education and services to the people etc. The company had to provide all its needs to get its product to market as there were few successful local small enterprises and Uganda was only beginning to attract foreign investment. CBL therefore owned a fleet of trucks and managed distribution networks all over the country and they set up and manned depots in all urban centres. Most raw materials were imported. Ugandans are entrepreneurial by nature and with the improving investment climate and a number of specific programs to build the capacity of small enterprises by government, private sector and academia, CBL was able to divest itself of many of these non core activities through linkages with other companies and small enterprises. The market expanded with the growing middle class and the regional markets created by the East African Community (EAC) regional block. CBL was faced with a fast growing market, which required further investment in new production lines. They faced the difficulties investors in Africa face where the financial sector was weak and interest rates were as high as 30% or more. A partnership formed with a foreign company was not successful as the company did not understand the business. Sales dipped and competition took over market share. The original shareholders bought back their shares and now found a more responsive financial sector. The Central Bank was better able to regulate the sector and maintain single digit inflation. Clear monetary policies, laws and regulations had been enacted and were being enforced. A number of financial institutions from South Africa, Kenya, Nigeria and Uganda had invested in financial institutions in Uganda and interest rates were coming down. 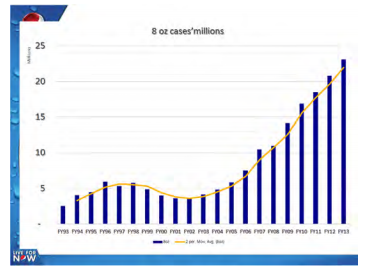 CBL was able to access credit from the East African Development Bank and the Orient Bank, which was a local bank, and with strong management, turned around the company to become the fastest growing Pepsi Franchise (see Figure). The company is among the top taxpayers, employs over 600 workers directly and over 4000 indirectly. It has played a key role in the growth of the creative industry by supporting music and sports. Many other enterprises in the value chain have benefited from this growth. For example, a female owned restaurant that has supplied food to the workers over the years has grown into a middle-sized hotel with its own premises. CBL continues to innovate to respond to increased competition in the market. Over 60 companies have invested in table water production. Others now produce juices. The EAC and the Common Market for East and Southern Africa (COMESA) regional blocks brought an attractive export market for CBL’s products, which can now be found in Kenya, Rwanda, Burundi, South Sudan and Democratic Republic of Congo. The downside to this is that Uganda also became a market for products from as far as Egypt, Kenya and Tanzania. CBL responded with new brands such as the popular Mountain Dew, new packs like PET and invested in table water production. It is an interesting time to be doing business in Uganda and Africa as a whole. The impact of businesses on communities through job creation and linkages through the value chain are more sustainable than donor funding of services to communities. Government and donor funding should be chanelled to improving road and rail infrastructure to allow trade between African countries and regions. Value addition through manufacturing will only be competitive in Africa if electricity is reliable and cheap. Donor funds could be used to leverage private sector funds in Public Private Partnerships (PPPs). The Bujagali Hydropower Project in Uganda is a good example of a successful PPP where the private IPS group has been supported by financing from International Finance Cooperation, CDC and Asian Development Bank, insurance from MIGA and a guaranteed Power Purchase agreement from the government. Donor funding should also target capacity building, information dissemination and access to credit for SMEs, especially in the agriculture sector where Africa can become a global supplier of food. I have shared the experiences of CBL doing business in Uganda only to demonstrate the opportunities and challenges faced by companies doing business in Africa. I hope I have shown how far Africa has come in addressing the main challenges and where support is still required. Markets are now assured with the fast growing middle class in the region and the global demand for African products. Through linkages with SMEs and job creation growth will become more inclusive and therefore more sustainable. It is an interesting time to be doing business in Africa as it is increasingly possible to succeed, even beyond all expectations. Prof. Maggie Kigozi is President of the International Federation of Business and Professional Women (BPW), Uganda.